In most cases it is a requirement that the results of a Zambezi Society project are compiled into a detailed and comprehensive Report Document once the project has been completed. Some of these are available for download online. Others may be ordered in hardcopy from the Zambezi Society, subject to a charge to cover the reproduction, packaging and postage costs associated with these large documents. Jul - Oct 2015. WILDCRU & The Zambezi Society in collaboration with Cheetah Conservation Project Zimbabwe, Wild Dog Conservation & Zimbabwe Parks & Wildlife Management Authority. 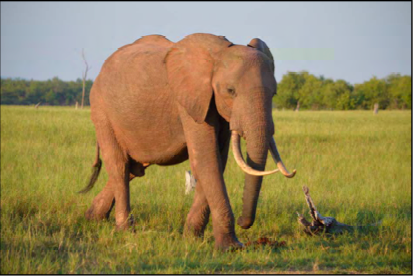 Zimbabwe National Elephant Management Plan 2015 - 2020. 2015. Zimbabwe Parks and Wildlife Management Authority in collaboration with all stakeholders. 19-22 May 2015. Zimbabwe Parks and Wildlife Management Authority in collaboration with all stakeholders. Summary Report of a collaborative workshop held by ZPWMA at Chirundu Safari Lodge, Zambezi River to develop an anti-poaching strategy for Mana Pools National Park and neighbouring Safari Areas. 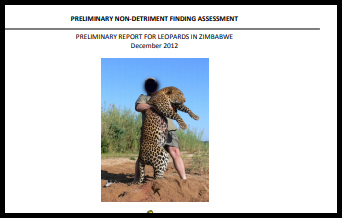 Proceedings of a workshop held in Harare, to discuss the Preliminary “non-detriment finding (NDF) assessment” for leopards in Zimbabwe. This is used to determine whether CITES quotas of species affected by trade are justified. 4-5th December 2012. ZPWMA – David J Newton, P.A. Lindsey and R. Chikerema-Mandisodza. 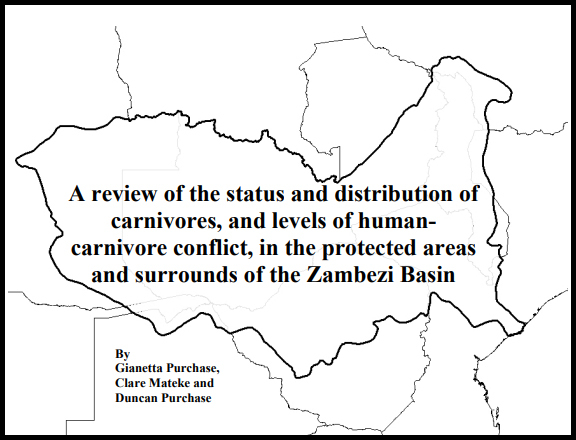 This review started the process of determining priorities for carnivore conservation in the Zambezi basin and of assisting governments and other management institutions to conserve carnivore species more effectively. 2007. Dr G Purchase/C Mateke/D Purchase, Zambezi Society. Summary Report of a 10-day seminar for National Parks managers from Zimbabwe and Zambia, held at RIFA camp, on the Zambezi River. 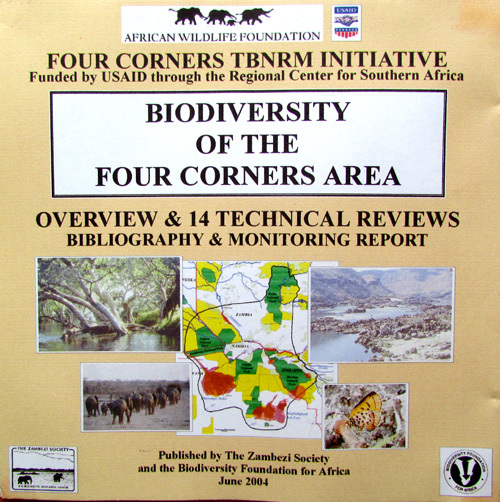 Three Biodiversity Information Packs produced by The Zambezi Society for the African Wildlife Foundation’s Four Corners Transboundary Natural Resource Management Initiative. They provide “interpreted” biodiversity information for key development planning, educational, land management and other stakeholders in the Four Corners area. Produced by The Zambezi Society/Biodiversity Foundation for Africa partnership for the African Wildlife Foundation‘s Four Corners Transboundary Natural Resource Management Initiative. It provides an Overview of the Biodiversity of the Four Corners Area, 14 technical reviews, a searchable Bibliography and a description of the establishment of a Biodiversity Monitoring Plot in the area. Produced by the Zambezi Society/Biodiversity Foundation for Africa partnership at the request of the Mozambican authorities. This report examines the area around Lake Cahora Bassa in terms of biodiversity and wilderness value so that planning decisions about land use can be made taking these factors into consideration. 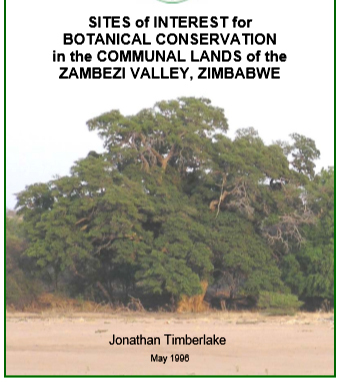 Summary of a study carried out by The Zambezi Society to examine the biodiversity, structure and condition of dry deciduous forest and thicket in the mid-Zambezi Valley in Northern Zimbabwe and Tete Province, Mozambique. Often used as refuges by elephants, these habitat patches have particular conservation significance in southern Africa because they are examples of a vegetation type which is rare and threatened wherever it still occurs. Proceedings of a transboundary workshop held by The Zambezi Society in July 2001 to plan a collaborative elephant management framework and strategy for three key Zambezi valley districts on the Zimbabwe/Mozambique border. Published by the Zambezi Society in partnership with the Biodiversity Foundation for Africa, and undertaken as part of a study for IUCN, The World Conservation Union. 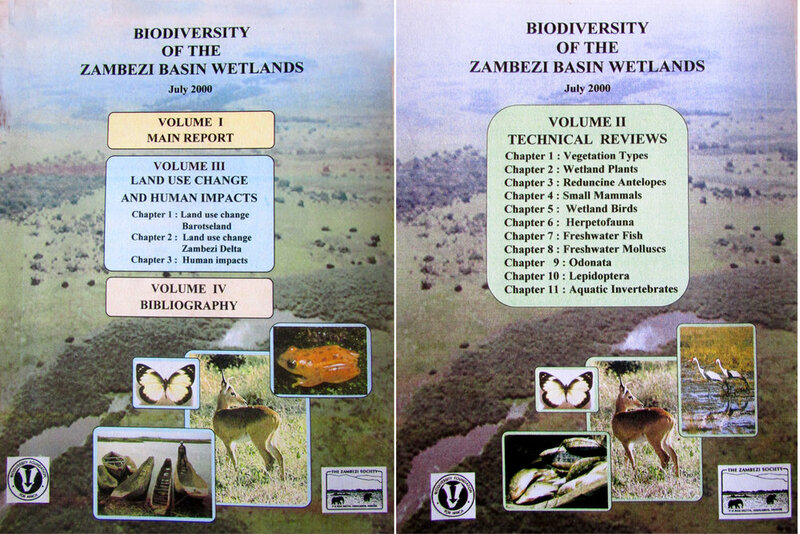 An outline of the evolution of the Zambezi system and its influence on ecosystems and species; details of existing knowledge of the biodiversity of the Barotseland, Chobe, Lower Shire and Zambezi Delta wetlands; preliminary assessments of sites and species that may need conservation actions; and likely future Zambezi wetlands conservation needs. Published by the Zambezi Society in partnership with the Biodiversity Foundation for Africa. This provides a detailed evaluation of he biodiversity of the Zambezi wetland areas. The full document contains four volumes. 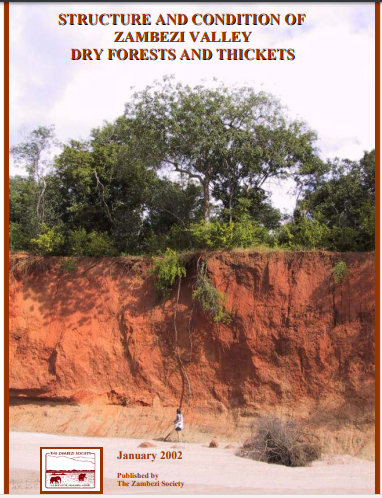 VOLUME II: A series of technical reviews covering eleven wetland groups – vegetation, plants, reduncine antelope, small mammals, birds, herpetofauna, fish, molluscs, odonata, lepidoptera and aquatic invertebrates. Summary of two surveys undertaken by the Zambezi Society during 98/99 to gather information about people’s perceptions of wilderness, its main values, its importance to Zambezi River visitors and users and the specific factors which enhance or detract from it. The findings are aimed at tourists, policy-makers and planners, investors, developers and consultants undertaking Environmental Impact Assessments on their behalf, custodians of wild areas and tourism operators. 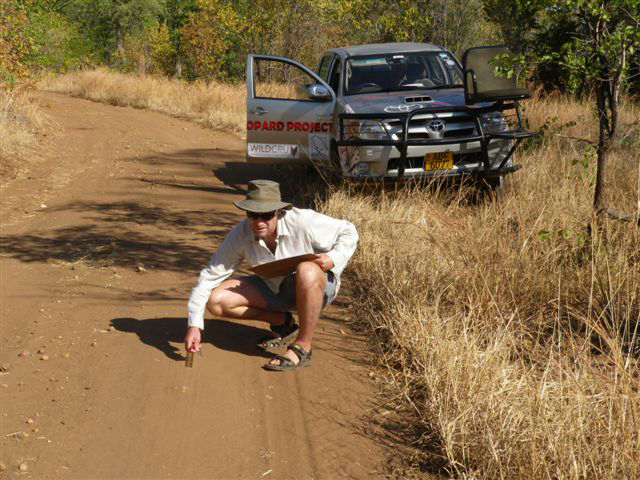 Outline of work carried out by The Zambezi Society tracking elephant movements by radio telemetry for two years in northern Zimbabwe to provide recommendations for future elephant management in the area. Published by The Zambezi Society and the Biodiversity Foundation for Africa. A detailed description of 80 sites of high botanical interest in six Zimbabwean districts, and work being done to conserve some of them.